QUESTION: How do I get my VA benefits started at UNA? Phone: 256.765.4971 Email: mdailey2@una.edu. Her office is located in the Guillot University Center (GUC) on the UNA Campus - you can download the forms she will need you to complete on our GI Bill Information page and bring them with you to help speed up the process. QUESTION: I just left active duty and am a new student at UNA, I really do not feel comfortable with the Fraternity/Sorority crowd since I am a bit older and wiser, is there an organization for Vets on campus? ANSWER: Of course there is, the UNA Military and Veteran Alliance is a group of military and veteran students, faculty and staff and other supporters in the community who advocate for veteran student issues. The group also plans social activities and participates in on-campus and community events. 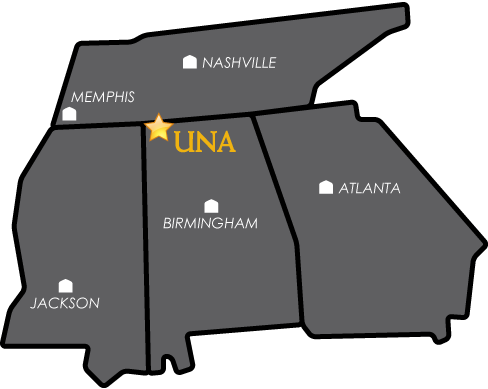 The UNA MVA is a recognized student organization and is an active chapter of Student Veterans of America (SVA) http://www.studentveterans.org. Simply contact the MVA president, Kandi Pike, Email: kpike@una.edu and she will assist you in what you can do to join. QUESTION: Veterans and active duty military personnel are considered automatically independent for federal need analysis purposes. However, the Veterans Administration and the US Department of Education use a different definition of veteran, leading to some confusion. How can I determine my veteran status? QUESTION: I am enrolled in school. When will I receive my benefits from VA? ANSWER: Because most schools start at about the same time, we are generally overwhelmed with enrollments at the start of a semester. It takes us about 10 to 12 weeks to process an enrollment during those times. Please be patient. We will process all of the enrollments in order by the date received. If you try to log into the Web Automated Verification of Enrollment system (WAVE) system and either cannot log in or see that your record has not been updated from last semester, we have not processed your current enrollment. If you are receiving benefits based on your status as a service person, veteran, or reservist, you must verify your enrollment at the end of each month in order to receive benefits. Benefits are paid after each month of school is completed. Verification can be done beginning the last day of the month by using our Web Automated Verification of Enrollment system (WAVE) or by calling toll free 1-877-823-2378 and using your touch tone phone. Both of these services are available 7 days a week, 24 hours a day. If you are receiving Post-9/11 (CH33) or Dependents Educational Assistance (CH35), benefits are sent automatically at the end of each month with no action required on your part. QUESTION: What if I am receiving Education benefits, am called up, and drop out of school without receiving credit? You are entitled to receive MGIB, MGIB-SR, VEAP, or DEA benefits through the date you dropped out of school. If you were called up under title 10 (federal authority), we will restore the entitlement you were charged for the period that you received benefits when you send us a copy of your orders or DD-214 verifying service under title 10. For example, if you were in school one month and had to drop out, you keep the money for that period and we will add back a month to your entitlement for you to use at a later time. If you were called up under title 32 (state authority), you don't receive the entitlement restoration benefit. If you have been overpaid education benefits, we will postpone collection action if you are deployed to a combat area. However, once you return from a combat area, you may be responsible for any overpayment of benefits. QUESTION: Are my education benefits taxable? ANSWER: No. Any veterans’ benefits paid under any law administered by the Department of Veterans Affairs (VA) should not be reported as income to the Internal Revenue Service (IRS). QUESTION: Can I receive credit for military training? ANSWER: As a veteran, active-duty, or reserve status member of the US Army, Navy, or Marine Corps, depending on your basic active-duty service date/basic pay entry dates (BASD/BPED), you may be eligible to receive and American Council on Education Registry Transcript credit. You must request that an official transcript be sent to the UNA admissions office so it can be evaluated for credit and applied to your student record. The Army American Council on Education Registry Transcript System (AARTS), the Sailor Marine Corps American Council on Education Registry Transcript (SMART), along with the Coast Guard Institute (CGI), have aligned to implement one collaborative transcript program. The Joint Services Transcript (JST) is a unified and standardized document that will make it easier for academic institutions to review and articulate recommended college credits, as appropriate, for professional military education, training courses and occupational experience of service members and veterans. The web site to access information and to request a Joint Services transcript is https://jst.doded.mil/official.html. Students with previous military experience in the Air Force still request an official transcript from the Community College of the Air Force. QUESTION: What's the earliest date I can use chapter 1607? ANSWER: Chapter 1607 benefits may be paid before the date of enactment the law, which was October 28, 2004. Chapter 1607 benefits are potentially payable from December 9, 2001 (90 days after September 11, 2001) for persons who were serving on a contingency operation on September 11, 2001 and who were in school on December 9, 2001. Note: "Contingency operations" as defined in title 10 U.S. Code means "military operations that are designated by the Secretary of Defense as an operation in which members of the armed forces are or may become involved in military actions, operations or hostilities against an enemy of the United States or against opposing military force; or results in the call or order to, or retention on active duty of members of the uniformed services under section 688, 12301(a), 12302, 12304, 12305, or 12406 of 10 U.S.C., chapter 15 of 10 U.S.C., or any other provision of law during a war or during a national emergency declared by the President or Congress." QUESTION: How do I apply forEducation benefits? ANSWER: VA Regional Processing Offices in Atlanta, St. Louis, Buffalo, and Muskogee are accepting applications and supporting documents for all Chapter claims. Submit an Application for "Application for VA Education Benefits" (VA Form 22-1990) and submit any available documents such as your Discharge from Military Service (DD Form 214), copies of orders to active duty and anything else available as evidence of qualifying service. A new application form is not required. However, you should submit any available documents such as your Discharge from Military Service (DD Form 214), copies of orders to active duty and anything else available as evidence of qualifying service to help establish eligibility for this program. You should also submit a "Request For Change of Program or Place of Training" (VA form 22-1995) this form is used to transfer your education benefits to the new school you want to attend.